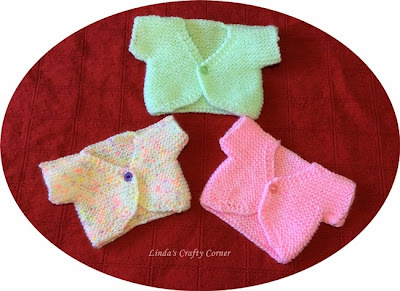 .Linda's Crafty Corner: Sweet Little Tops. I love Facebook because there is so much inspiration and lots of beautiful free patterns to be found like this little baby cardi. This pattern is so simple, it's knitted in one piece the only sewing being the shoulder and little sleeve seam. I took it along to show the ladies in the Day Unit where I work and they fell in love with it and wanted to knit some too so between us this is what we have made so far. I think there will be lots more before very long. These are going into my Preemie box to be sent to a local preemie baby group who distribute preemie items to neonatal units throughout England. 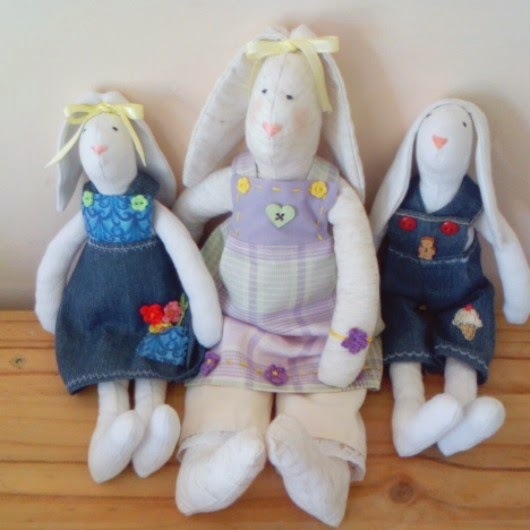 A big thank you to Teresa Roberts for designing this pattern and sharing it with us, it comes in a newborn size too, because the link to the pattern doesn't work Teresa has given me permission to print it here on my blog. 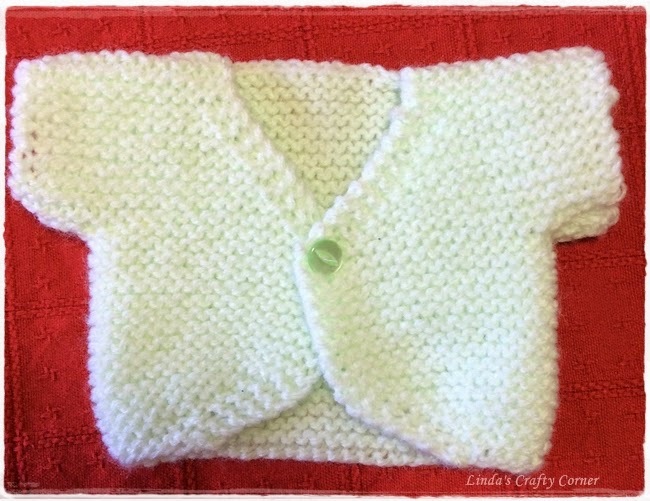 Small Baby Cardi by Theresa Roberts. Knitted in DK yarn on no.8 /4mm needles.Garter stitch(all rows knit).Takes approx 25 grams of yarn and about two hours to knit. Tension or finished measurements is not crucial. Worked from the bottom up,in one piece up to arm holes. Larger size in brackets..Measures 16/17ins chest..7ins back length..takes about 60 grams of yarn. Cast on 40 sts (60 sts) Knit 2 rows. Increase row.knit 2 sts.inc in next st. knit to last 3 sts,inc in next st. knit 2. Repeat this row until you have 60 sts (90 sts). knit straight until 26 rows (40 rows) have been knitted from the cast on. Buttonhole row. knit 2 sts..yarn forward,knit 2tog..knit to end. knit to last 16 sts (23 sts ) put these sts onto a sts holder. Work fronts**Put 16 sts (23 sts ) back onto needles.Join yarn...cast on 5 sts (24 sts ) knit these sts and rest of row..
front edge decrease row...knit 2 sts.knit 2tog.. knit to end of row..
repeat from** for the other front..
join shoulder and under arm seam..sew on button. you're done. Note this pattern as written,gives the small size ,little cap sleeves,and the larger size long sleeves. 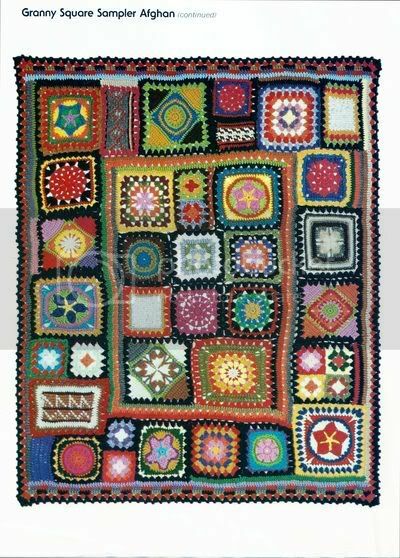 Please enjoy this pattern,you may gift or sell the cardies.Please DO NOT try to sell this pattern,or alter it to call it your own....many thanks. 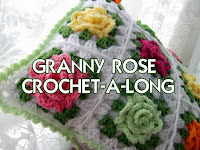 Find a similar crochet version here. They are so lovely Linda. The end is in sight on Elmer!!!!!!! Amazing! They looks like candies, so sweet! Lovely tops. 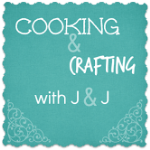 I'd love to make some but the Facebook link doesn't work...even when I log in. Thanks for this. I will definitely make some of these. What a great project and so needed! They are so simple yet so effective. 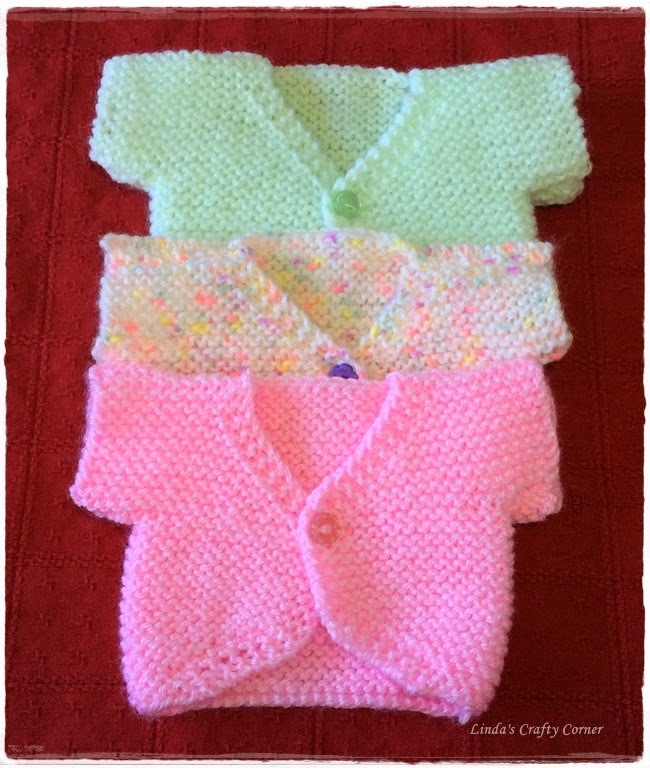 Knitting was so important to my mum in her last years, it made her feel she could still help others, so I'm sure the ladies in the day unit will get a big boost from making these. They're so sweet. I am sure they will be appreciated. I have crocheted some tiny things like this for charity in the past. 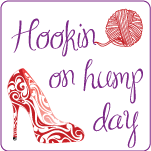 I would like to make some when I eventually get better at knitting too, so thank you for sharing the pattern. 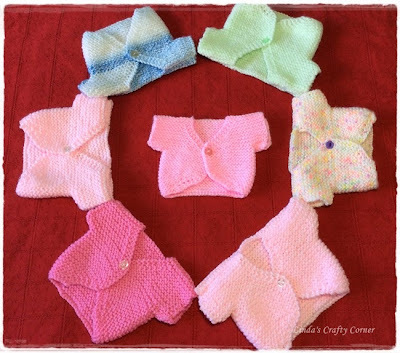 It is a wonderful pattern and preemies need that extra warmth! so beautiful! love these little sweaters and will have to see if I can find a crochet pattern or learn to knit. We make blankets and sewn items for our local Newborns in Need chapter and I bet they would LOVE these at the local hospitals! Such adorable jackets and made with such love! 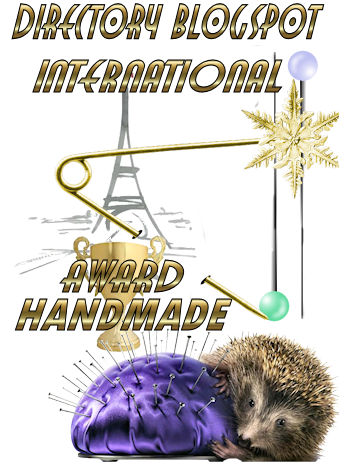 Congratulations, you are the winner from last weeks Link your stuff. You are welcom again tomorrow. I made the premmie size its really cute sob I decided to make the larger size and got to the point I'm the pattern where you decrease for the front. It says to decrease until you have 38 sts left and that is impossible so I. Will have to guess how many sts to decrease unless you have a correction for that number. 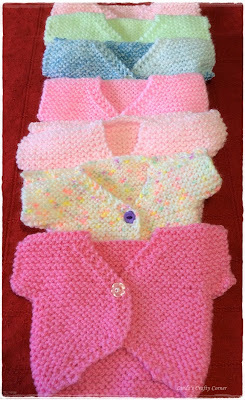 I was trying to find something cute to knit for my friend's granddaughter who is due to arrive in August. Well, I found it: I'm going to knit this beautiful little cardi in pink ! Thank you so much. I am working on a small one. I did make longer sleeves on it so I was glad to see in the above comments that the bigger one has longer sleeves. I was wondering how it would turn out and now it seems I've got something to compare notes on. Thank you for this adorable pattern! 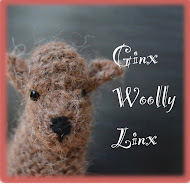 Is it (are you) on Ravelry so I can link it three (and thus keep track of the pattern)? Hi Amy I am on Ravelry just click the R button at the top right side bar, however these little jackets are not my design so you won't find them there. The designer is Teresa Roberts and I don't think she's on Ravelry. Found them (and you)! Thanks so much. I would like to make the larger size using Sports Weight instead of dk. Will that be okay?